To illustrate the Taylor principle noted above, the figure shows how the Taylor rule would evolve under higher- and lower-inflation scenarios between now and the end of 2020. In the former, inflation would increase by 12.5 basis points per quarter (0.5 percentage points per year) from the third quarter of 2018 to the fourth quarter of 2020. In the latter, inflation would slow by 12.5 basis points per quarter. Each scenario assumes that the output gap remains constant at the value that prevailed in the third quarter of 2018. As expected, under the higher-inflation scenario, the rule indicates that the Federal Open Market Committee should continue to raise its target rate. It indicates the opposite if inflation were to slow—again, under the assumption of an unchanged output gap. 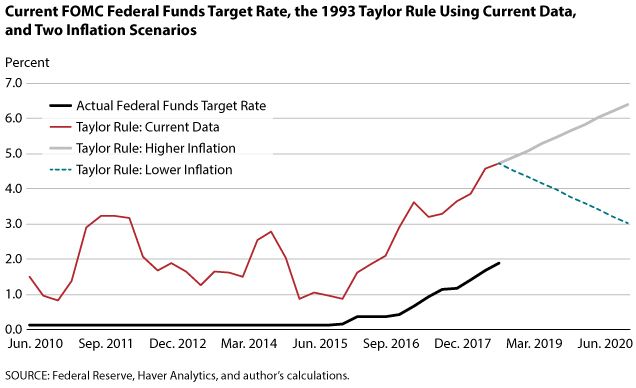 The large discrepancy between the actual federal funds target rate and the rate indicated by the Taylor rule using current data suggests that the Federal Open Market Com­mittee may be following a different version of the Taylor rule. In a recent speech, Federal Reserve Bank of St. Louis President James Bullard presented an alternative—"modern­ized"—version of the Taylor rule. Part 2 of this Economic Synopses essay will assess whether the actual federal funds target rate more closely hews to the version described by Bullard. 1 See the edited volume by Koenig, Leeson, and Kahn (2012). 2 The output gap uses the measure of real potential GDP calculated by the Congressional Budget Office. I have converted the Congressional Budget Office measure, which is still reported in 2009 dollars, to 2012 dollars so as to match real GDP. The output gap is typically measured in terms of percentage deviations—that is, the percent that real GDP is above or below real potential GDP. The original Taylor rule used the four-quarter percent change in the GDP price deflator. 3 See Taylor and Weiland (2016). For an alternative perspective, see Laubach and Williams (2016). 4 The FOMC raised the target range for the federal funds rate by 25 basis points to 2 to 2.25 percent at the conclusion of their September 25-26, 2018, meeting. However, the average rate for the quarter (using daily data) was 1.88 percent. Koenig, Evan F.; Leeson, Robert and Kahn, George A., eds. "The Taylor Rule and the Transformation of Monetary Policy." Stanford, CA: Hoover Institution Press, 2012. Laubach, Thomas and Williams, John C. "Measuring the Natural Rate of Interest Redux." Business Economics, April 2016, 51(2), pp. 57-67. Taylor, John B. "Discretion versus Policy Rules in Practice." Carnegie-Rochester Conference Series on Public Policy, 1993, 39, pp. 195-214. Taylor, John B. and Weiland, Volker. "Finding the Equilibrium Real Interest Rate in a Fog of Policy Deviations." Business Economics, July 2016, 51(3), pp. 147-54.